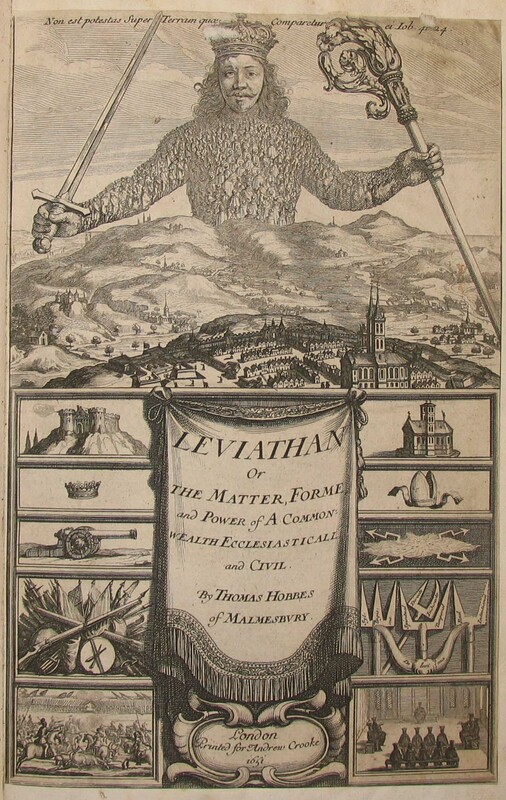 The full title of this book is Leviathan, or The Matter, Forme and Power of a Common Wealth Ecclesiasticall and Civil, and it was first published in 1651. Titled after the biblical Leviathan, an enormous sea monster representing chaos and evil, Hobbes used it here to describe the Commonwealth under Cromwell. The book deals with the structure of society and legitimate government, and is considered one of the earliest and most influential examples of social contract theory. The impressive frontispiece shows earthly power represented by the castle, battlefield and crown on the left, spiritual power represented by the church, court and Bishop’s mitre on the right. The sovereign is shown as a giant rising above, ruler over both. Influenced by the Civil War, Hobbes wrote that in order for there to be peace, a strong central government was needed, and that an absolute sovereign was the only way for this to be achieved. The Chapter Library contains two copies of the Leviathan, including a first edition. The second copy belonged to William Cave, Canon of Windsor 1684-1713. On his death, his entire library was purchased from his executors at the cost of £645.